Located in Futian, this hotel is within 1 mi (2 km) of Shenzhen Central Park and Huaqiangbei. Shenzhen Convention and Exhibition Center and Coco Park are also within 3 mi (5 km). Yannan Station is 6 minutes by foot and Science Museum Station is 10 minutes. 2 restaurants, a fitness center, and a 24-hour business center are available at this smoke-free hotel. Free WiFi in public areas and free self parking are also provided. Other amenities include a conference center, coffee/tea in a common area, and conference space. All 266 soundproofed rooms provide free WiFi, free wired Internet, and memory foam beds. For a bit of entertainment, LCD TVs come with digital channels, and guests will also appreciate thoughtful touches like pillow menus and bathrobes. Dining is available at one of the hotel's 2 restaurants. Public areas are equipped with complimentary wired and wireless Internet access. A 24-hour business center is on site at this 4-star property. Event facilities measuring 2152 square feet (200 square meters) include a conference center. For a surcharge, the property provides a roundtrip airport shuttle (available 24 hours) and a train station pick-up service. This business-friendly hotel also offers a fitness center, multilingual staff, and coffee/tea in a common area. Limited complimentary onsite parking is available on a first-come, first-served basis. A total renovation of this property was completed in September 2018. 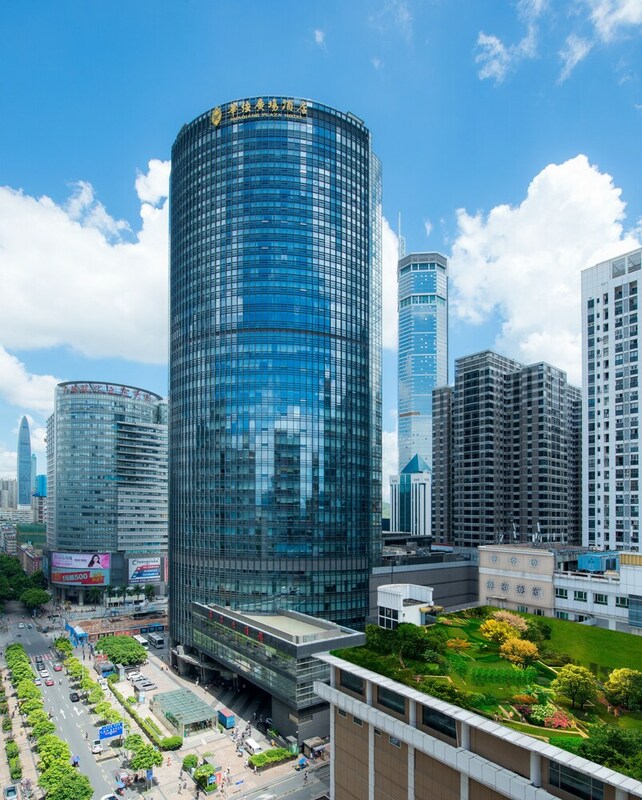 Shenzhen Huaqiang Plaza Hotel is a smoke-free property. Coconut western restauran - This restaurant specializes in seafood and serves breakfast, lunch, and dinner. Open daily. 华宴中餐厅 - Onsite restaurant. Open daily. Start your morning with a buffet breakfast, available each day from 7:00 AM to 10:00 AM for a surcharge. Room service is available during limited hours. Rollaway/extra beds are available for CNY 200.0 per night. Guests must transfer via airport shuttle to the property. Guests must contact the property at least 24 hours before travel, using the contact information on the confirmation received after booking. This property offers transfers from the airport (surcharges may apply). Guests must contact the property with arrival details before travel, using the contact information on the booking confirmation. Guests under 18 years old are not permitted at this adults-only property. Only registered guests are allowed in the guestrooms.